INDUSTRY.co.id - Jakarta - Face the Lebaran season 2018, the Ministry of Transportation released the survey results of the location of most homecoming locations, among others, the first number occupied Central Java, East Java, West Java and Yogyakarta. The survey was conducted by Ministry of Transportation Research and Development Agency on 4,075 respondents using online method from social media and Ministry of Transportation website. 76 percent of Whatsapp apps, 14 percent of Ministry of Transportation websites, 2 percent facebook, 2 percent Line, 1 percent from Instagram, and 5 percent from other sources. 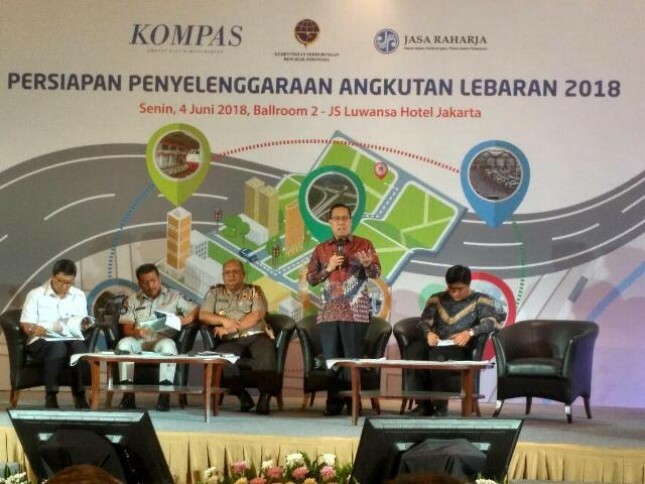 "From the results of the survey, it is known that the highest number of travelers comes from Jabodetabek area, which is 60 percent, with the aim of the first order of 28 percent Central Java, the second 13 percent of East Java, the third 10 percent of West Java and the last 9 percent of Yogyakarta," Head of Research and Development Agency Ministry of Transportation Sugihardjo in the dialogue 'Preparation of Lebaran Transportation 2018' at Hotel JS Luwansa, Jl. HR Rasuna Said, South Jakarta, Monday (4/6/2018). According to Sugihardjo, the peak of homecoming flow based on the survey is predicted to occur on H-6 Eid. While the flow back Lebaran predicted occur H + 3 widths. "For the peak of the homecoming flow based on the survey, it happened on H-6 Eid on Saturday, June 9, 2018 and the first day of Idul Fitri. For reasons for choosing their own homecoming time, as much as 52 percent said waiting for leave of absence, while for the peak of the return will happen to H +3 Eid on June 19, 2018, "he explained. Sugihardjo mentioned 46.7 percent of respondents chose to go home using private cars. The reason, the personal car felt more flexible, comfortable, and fast. Public transportation facilities for mudik Lebaran this year also increased. Improvements occurred in land, sea and air transportation. "Transportation facilities have increased from the previous year, for land transportation such as buses increased by 1.68 percent, while trains increased by 2.37 percent. For the readiness of sea transport percentage increased, roro boats increased by 3.5 percent and ships as much as 1.17 percent, while the flight sector increased as much as 0.93 percent, "he explained.